Throughout my elfin years, every Christmas morning went the same way. I would wake up at a reasonable hour – say, 8am – and creep down the hall of my small apartment, hoping not to wake my parents as I looked, but never touched, the color-coordinated packages under the tree. I was always half successful. My father sleeps like a rock and would likely not be shaken by an earthquake. My mother, on the other hand, although exhausted from “playing Santa” the evening before, would always hear me and be the first to wish me a “Merry Christmas”. My mother is the antithesis of Martha Stewart, but every Christmas, she dreamed up a theme that complimented our Christmas tree ornaments; purchased bags, tags, bows, dangley things and wrapping paper that matched that theme; and wrapped presents until 3 am, staggering them according to height, weight and aesthetics. Eventually, my father’s internal clock decided that he was ready to grace us with his presence and the opening commenced. And then we would eat Eggnog French toast. Well, my mom and I would eat it, while my dad had a muffin or something since he doesn’t share our eggy affinity and prefers his breakfast syrup-free. My mom got her recipe off the back of an eggnog carton and made it every year. And it wasn’t very good (sorry, Mom). Well it was good, but it was just French toast. There was nothing noggy about it, because it was made with the booze-free store variety, which is, essentially, a custard base. Sure, it has some nutmeg in it, but we always added cinnamon to our French Toast batter anyway, so the flavor profile was identical to our typical version. But for my eggnog-loving mother, it was Christmas on a plate. While I enjoy the taste of eggnog, I have trouble getting past the second sip. I eat things that are just as rich but usually pass on liquid indulgences (save for a dark hot chocolate). For whatever reason, I just cannot justify slinging back something sinful, as it cannot be savored like a nice piece of dessert and usually leaves me yearning for an equally sinful accompaniment. And beyond the French toast, eggnog “flavored” things have always fallen flat for me. Again, because of the ingredient list, my Grandmother’s attempt at eggnog cookies just tasted like a faintly spiced sugar cookie. And anything commercially made tastes artificial. 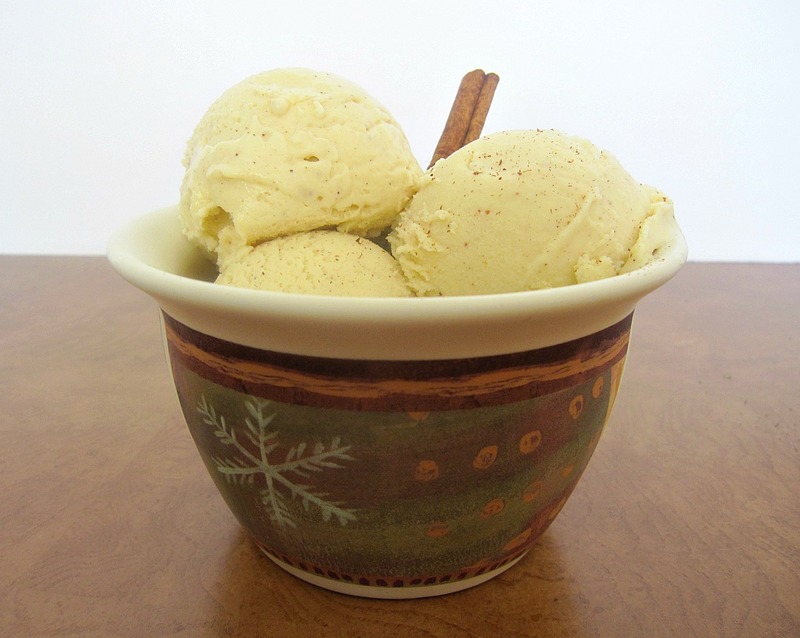 When I wanted to have my eggnog and taste it, but not drink it, I thought this eggnog ice cream would fit the bill. Well, that was part of it. I actually decided to make it when I was left with 6 egg yolks after testing pavlova, which, unlike whites, cannot be frozen very successfully. A carton of heavy cream later, and eggnog ice cream was churned, frozen and delivered. For once, the product tasted like eggnog. I felt less guilty about it, because (until it melted, anyways), it was eaten by spoon, not sipped from a straw. If not for a good shot of rum and a healthy dose of freshly grated nutmeg, it would have been vanilla ice cream. These two ingredients made it happen and helped me feel jolly. I always add a bit of liquor to my ice cream, not for flavor, but for texture. 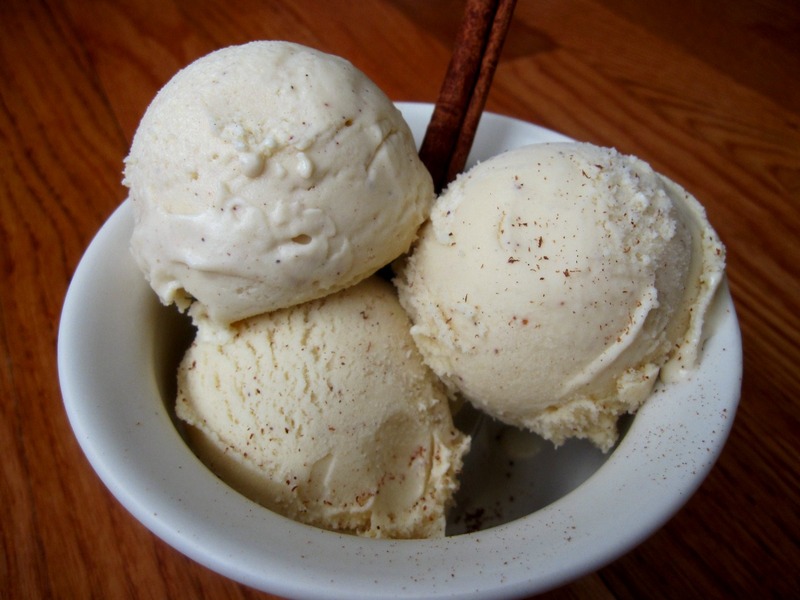 Since alcohol doesn’t freeze, it keeps homemade ice cream soft and creamy and prevents ice crystals from forming. The addition of a couple teaspoons of vodka goes completely undetected. 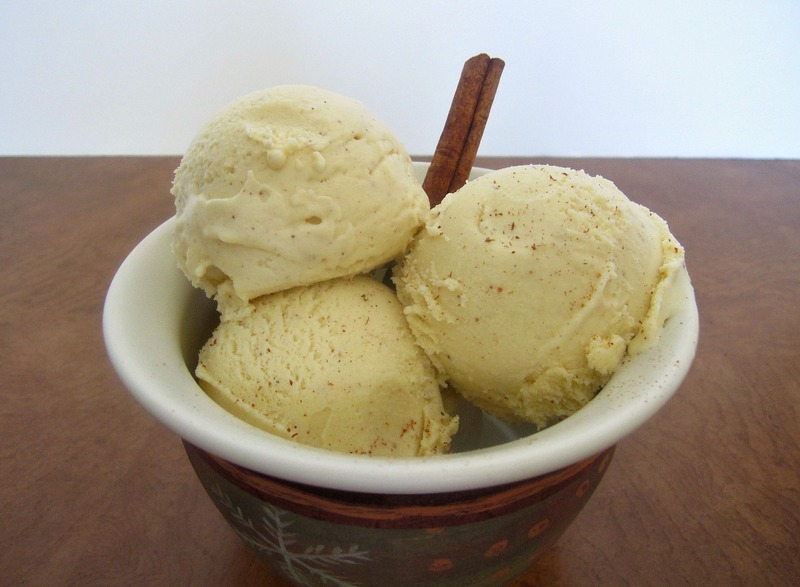 Here, you get that holiday rum flavor with the added benefit of a super creamy ice cream. And, as I usually only use five yolks for ice cream, that extra yolk certainly didn’t hurt the texture. It has been several years since I’ve had my mother’s eggnog French toast (which was also a bit on the soggy side). This year, though, I got my eggnog in and thanks to ice cream expert David Lebovitz, it didn’t come in a glass. Over medium low heat, warm milk, sugar and salt in a medium saucepan until sugar is dissolved. Pour heavy cream into a large bowl with a strainer set on top. In a medium bowl, whisk together the egg yolk. Temper the yolks by pouring in and continuously stirring a small amount of the warm milk mixture. Keep whisking and slowly pouring in the contents of the saucepan. Pour the yolks and milk back into the saucepan and stir constantly with a spatula, scraping the bottom as you stir, until the mixture has thickened and coats the spatula. If you run you finger down the spatula, the line should hold and not fill in with custard. Pour the custard through the strainer and stir it into the heavy cream. Mix in the nutmeg, brandy, rum, and vanilla and stir it over an ice bath until the mixture is cool. Chill the custard in the refrigerator for 8 hours. Before pouring it in the ice cream machine, taste it to see if you would like to add more nutmeg. Freeze in an ice cream maker according to the instructions. Serve with a dusting of ground nutmeg or cinnamon if desired. *Knowing the tastes of those who would be eating this ice cream, I only used 2 tablespoons + 1 teaspoon of rum, because that’s what I had on hand. A second test with brandy proved that it’s smooth flavor is absolutely essential! Wish I could make ice cream, but no ice cream maker :( I am a huge fan of egg nog the beverage, though, so I will be making the Test Kitchen Feed’s recipe here shortly. I have some leftover yolks from the macaroons I made. Yummy! I love eggnog everything, it seems. I made eggnog truffles just this weekend, and they were AMAZING. This looks pretty great too. I don’t typically make ice cream in the winter because I’m already so cold, but this could certainly pique my interest!